As of December 1st, the park hours are from 7am and closing at 6pm. Our Marina hours are 7am to 5pm. Trout fishing has been excellent with the water temperature between 52 and 54 degrees. Shore fisherman and boaters alike are pulling out their limits. Our Trout fishermen have been using a variety of bait. Power Bait Eggs in white and green along with Berkley Gulp Floating Worms in Fluorescent gree also Power Bait Rainbow , Orange Twist and Lemon Twist, Power Bait Com and Blue Fox, and Kastmasters. If you plan on boating early is best with the surge in trout being caught we have seen the number of fishermen rise. Large mouth and Small mouth have had a few pulled out using Spoons an Cranic Bait. Striper fishing has slowed down some but the bait of choice is still Anchovies, Sardines and Night Crawlers. Suzette Mortini of Livermore caught 2 Trout with the stringer weighing 11 lbs. the largest Trout 7 lbs. 2 oz., 3 lbs. 1 oz. using Rainbow Power bait at the East Beach on 11/19/10. 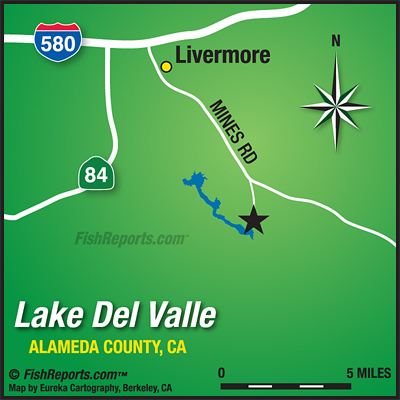 David Heist of Livermore caught 4 Trout with the stringer weighing 13 lbs. 6 oz. using Green Roster tail at the East beach on 11/19/10. Tetsu Okano of San Jose caught 6 Trout the largest weighing 2 lbs. using Orange Power Bait with Garlic Dip at the East Beach on 11/20/10. Terrence Barros of Fremont caught 2 Trout weighing 2 lbs. 1 oz. using White Worm Power bait at the Oak Tree at the East Beach on 11/20/10. Alexis, Denise, and Danielle Hein of Sunnyvale caught 3 Trout with the stringer weighing 7 lbs. 1 oz. the largest Trout weighed 4 lbs. using Orange Power bait at the East Beach on 11/20/10. Sergio Martin of San Ramon caught a 5 lb. Trout using yellow power bait in the East Beach on 11/21/10. Mario Rodriguez of Pleasanton caught 5 trout with the stringer weighing 25 lbs. the largest Trout weighing 7 lbs. 9 oz using Marsmallows and Night Crawlers at the Point near the Marina on 11/23/10. Mike Rackham of Livermore caught 7 Trout with the stringer weighing 18 lbs. 6 oz. the largest Trout weighed 6 lbs. 5 oz. using white eggs at the Dam on 11/24/10. Travis Tiffany of San Jose caught 3 Trout with the stringer weighing 2 lbs. 2 oz. using a Needlefish on 11/24/10. John Kitta of Fremont and Bill Bense of Dublin caught 8 Trout with the weight of the stringer 37 lbs. 5 ox. the largest Trout weighed 7 lbs. 4 oz. using Power Bait at the Dam on 11/24/10. Brian Jacobsen fo San Jose caught an 8 lb. Trout using a Kastmaster on 11/25/10. Jason Hubbs of San Leandro caught a 7 lb. 6 oz. Trout using Night Crawlers on 11/25/10. Bryce Beesley of Livermore caught a 2 lb. Trout using a Super Duper in the Harrows on 11/25/10. Matt Wirth of Livermore caught 20 Large Mouth Bass using Plastic Worms in the Narrows on 11/20/10. Dave McGurie of Boulder Creek caught a 1 lb. Small Mouth Bass using a Panther Martin on 11/20/10. Jack Foranzo of San Antonio Valley caught a 17 lb. Striper at the Point in the East Beach on 11/15/10.